A WAKE UP CALL FOR BIAFRANS IN NIGERIA POLITICS TO SUPPORT THE 30TH MAY 2017 SIT AT HOME AND THE STRUGGLE TO RESTORE BIAFRA. It is not supposed to be a news to Biafrans who are in Nigerian politics to join the leader of Indigenous People of Biafra Mazi Nnamdi Kanu in the struggle to restoring our motherland, BIAFRA. Sometimes I asked myself series of questions concerning Biafrans in Nigerian politics today, could it be that they are afraid of the Northerners or could it be that they are afraid of the Westerners, what could be their reasons for not joining hands with Mazi Nnamdi Kanu in the struggle for the restoration of Biafra? It has been observed by Family Writer that some of our brothers in Nigerian politics have been visiting the leader of Indigenous people of Biafra Mazi Nnamdi Kanu in his home town ever since he was granted bail by Justice Binta Nyako of the Federal High Court Abuja, to encourage him in his good work to see that Biafra is restored. However, the recent arrest of Ifanyi Uba by the Nigeria DSS and the molestation of our people by the Muhammadu Buhari led government supposed to have opened the eyes of our people to understand that Nigeria did not mean well for us. We ask Biafrans in Nigerian politics what they have gained when they allowed the Nigerian Army molest our mothers at Abiriba in Biafraland. Biafran politicians allowed Muhammadu Buhari and the Nigerian Army to kill our brothers at Portharcort (Igweocha) who are on solidarity rally for newly elected president of United State of America, Donald Truph on January 20th, 2017. What did we gain from you when our brothers were killed by Nigeria Army and police at Nkpo in Anambra state on 30th May, 2015 in respect to our fallen heroes and heroines, when most our brothers and sisters are being arrested for exercising their human rights while Hausa terrorist Boko Haram are under Nigeria pay role. We expect that most of you will put more effort and join our leader in the struggle to restore our land BIAFRA, for what ever position you campained for in Nigeria you can as well campaign for it in Biafraland when Biafra is restored. Let's manage our resources, let's create a good future for our generation and generation after us, for BIAFRA is our hope. My expectation from every Biafran politician in Nigerian political office is to support the SIT AT HOME order on 30TH May 2017, it will show how much we need BIAFRA as some International communities will be observing the event. and sisters were molested and arrested few days ago by Nigerian Army at Abiriba and you kept quiet over it, even though they were later released. Rise up now and join the moving train(IPOB) lead by Mazi Nnamdi Kanu. 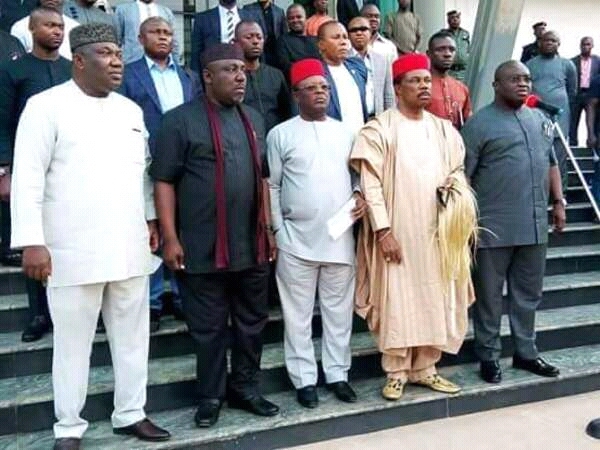 The Biafra political group you are talking about in Nigeria, all of them are heavily and fantastically corrupt like their leaders in Nigeria and they have no conscious because of their selfish interests and evil inclinations. Don't expect any thing good from them. They are against Biafra freedom and Restoration.